Oh, No! Jerry Jones and the Anthem Again! New Orleans Around the globe, football means soccer, and the recently concluded quadrennial World Cup was its showcase. In America, football is a different thing altogether, especially when it comes to the endless draft-to-summer-to-exhibition-to-regular season-to-playoffs-to-Super Bowl, National Football League on the professional level. Once again, as exhibition games get ready to begin, we’re having to read about people like Dallas Cowboys owner Jerry Jones and the anthem singers as the controversy with the players continues. On the plane I was reading Sergio de la Pava’s Lost Empress and was constantly getting confused on whether fiction was stranger than truth or truth stranger than fiction. In the novel, Nina, the daughter of the owner of the Dallas Cowboys whose health is failing in Tom Benson fashion, in a preview of his estate gives the Cowboys to his oldest son and bequeaths the football savant, Nina, with the Paterson Porkers of the International Football League. That’s Paterson, New Jersey, if you were unclear. The NFL owners in the book decide to lockout the players in order to take 60% of the revenue rather than 56%, and Nina senses the opportunity to grab the fans and players attention by having the IFL rise in the fall as the NFL cancels their season. I haven’t finished the book, but we’re all rooting for Nina and the little pigs over the greedy pig owners of the NFL. In the daily papers we find that the saga of the players’ protest over police brutality and racial discrimination that the Twitterer-in-Chief made an issue of anthem and flag when the even richer owners cravenly caved before him like cheap suits. Now the issue is hot again. Colin Kaepernick and Eric Reid, two players leading the protest are still being blackballed and have both filed grievances with the union. The NFL had tried to defuse the issue for this year by saying no on-field protest, by which they mean on-camera really, but do your thing in the locker room, but anarchy would rule and teams could fill in the blanks with their own rules. The union objected since it was a unilateral change, and the league suspended the rule change to try to negotiate something with the union and the players. Not good enough for the flaming Jerry Jones and the Cowboys who claim they will force players on the field. The Miami Dolphins want to give protesting players multi-game suspensions. Players are unhappy. It’s a hot mess. All of which makes me wish that Nina was the commissioner of the NFL in reality rather than just a character in a novel. Believe me, having a sport that cared about the fans and players rather than a plaything of the superrich would guarantee a winner for all of us! Gulfport Jerry Jones, bully-boy owner of the Dallas Cowboys team in the National Football League has not had a good year, though he is likely too oblivious to know it, and, as bad as his year has been, it’s been an even worse year for everyone and everything he touches. On his own account, he has become one of the only members of the American superrich to have perfected the art of the Trump Two-Step. Don’t pretend you don’t know what I’m talking about. The Trump Two-Step is where he puts his foot firmly in the wrong direction, either down his own mouth or in some outrageous lie, claim, or endorsement, and then when the rest of the world catches up to his con, claims it was a win, he was right, and the whole world is wrong. When Jones was just beating his chest and boasting about the Cowboys, his billion dollar stadium, and his little patch of ground in the Dallas-Fort Worth metroplex, who cared? That kind of behavior was just part of the package. Then Trump gets elected, Jones makes the mistake of thinking the whole world has changed, and all bets are are off. He thinks the Trump election means that the first amendment is now last, freedom of speech is history, he owns the plantation, and all protests are outlawed. Wrong, and Local 100 is part of the slapdown there along with almost all of the other NFL owners who look the other way. His players are so mortified they have to call him into the clubhouse and school him on race and the police. 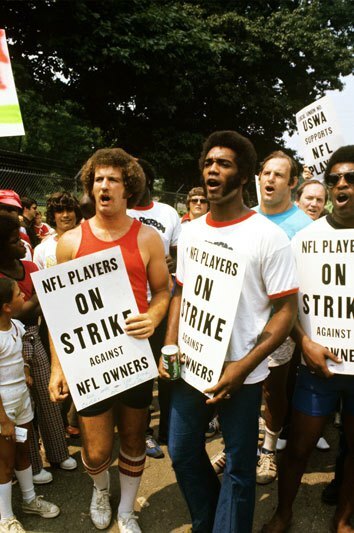 He tries to hold up the NFL Commissioner’s contract and gets humiliated. The then doubles down and makes it clear in the time of #MeToo that his real beef with the Commish is the fact that he thinks his star running back should just get a hand slap for domestic abuse rather than a multi-game suspension. Once again, Jones is living in the 50’s and even the retrograde NFL knows you can’t sanction women beating anymore. Of course, Jones doing the Trump Two-Step claims he still won somehow, while the Commissioner gets $40 million per year for the next five or so. You hear what I’m saying, everything Jones touches now goes south. His lawyer in threatening the NFL contract is big name litigator, David Boies. He gets crossways on ethics because he was representing the NFL on some matters and is now part of the Jones mess threatening to sue them. Awkward! Now one newspaper after another has written about the constant conflicts that Boies finds himself in and his reputation has dropped like a rock as someone who’ll do anything for another buck, and represent both sides against the middle. 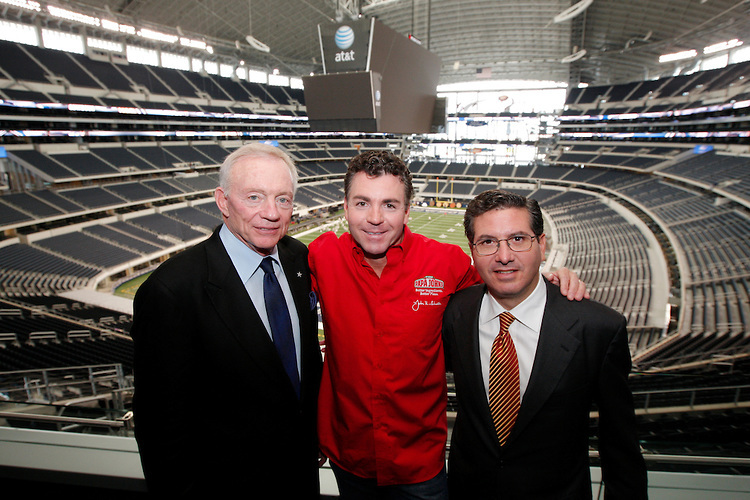 And, now the Papa John Pizza man, John Schnatter, is taking a fall for Jones. Remember Schnatter seemed to be pimping for Jones when they were playing flag football, claiming after Jones stirred up the controversy that all of the mess was hurting his pizza sales and faulting the NFL’s leadership for not toeing the Trump line. Jones turns out to own or co-own 120 Papa John’s franchises. Jones claims Schnatter is a great American and “when he talks, I listen.” Most of the sporting pages around the country placed their bets on the fact that when Jones talked, Schnatter also listened. Now it turns out that Schnatter’s likely listening meant that he gets to walk the plank for Jones. Turns out the rest of Papa John’s people didn’t like being touted as the go-to-place for white supremacists or having politics become their special pizza topping. The stock price has fallen even more than pizza sales. Schnatter gets booted upstairs. Jones knows the Trump Two-Step, so he’ll claim he had nothing to do with any of this. He’ll probably throw Mr. Papa John under his golf cart, and claim he hopes the stock and sales in his stores will go up now. Take a hint and learn from the last year. If you are a friend, associate, or employee of Jerry Jones, recent history says, buy a clue, and make a new year’s resolution to stay clear of him as much as you can. Until he figures out how out of step he is with the rest of America, he’s toxic, and he’ll bring you down.